LBN 777 - Click to view larger image. Opens in a new window. Lynds Bright Nebula (LBN) 777, also known as either the Vulture Head Nebula or the Baby Eagle Nebula, is a faint reflection nebula in Taurus. It lies about 4-1/2 – 5 degrees (that’s 9-10 Full Moon widths) northeast of the much easier-to-see Pleiades star cluster. The brown patch just to the right of the Vulture’s “eye” actually has its own designation: it is a dark nebula cataloged as Bernard 207. 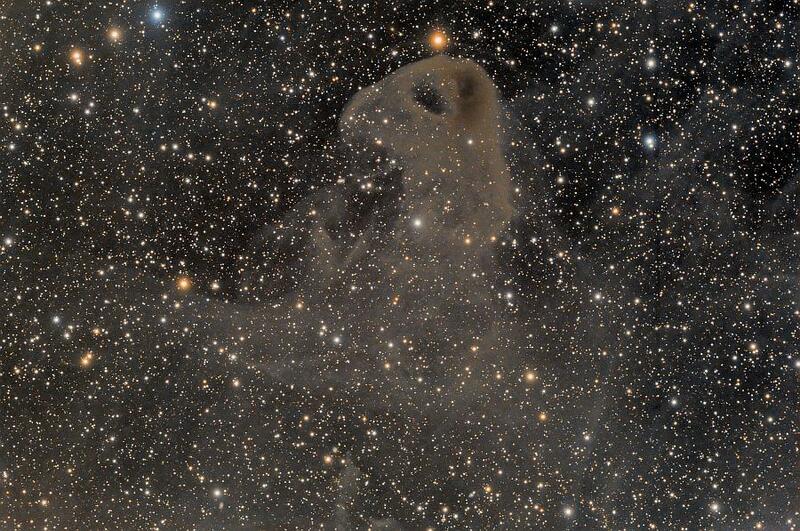 LBN 777 is a portion of a large cloud of gas and dust known as the Taurus Molecular Cloud. The brownish color is caused by large dust grains embedded in the gas, which reflects the light of stars inside and near the nebula. Equipment Used: Takahashi TOA-130F on an Astro-Physics AP1200GTO mount. SBIG STL-6303E camera with FW8-STL filter wheel and Astrodon LRGB and narrowband filters. Robofocus focuser and Astrodon Takometer rotator.